It is said that a picture is worth a thousand words, so we have put together the following set of illustrations to assist newcomers to the game in learning what to do. There are fourteen pictures in total, equivalent to fourteen thousand words. Left: Preparing the Norman. 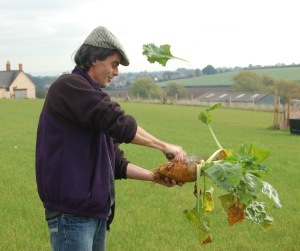 The leafy top of the Norman is removed with one deft blow of the Special Cutting Tool. Always cut AWAY from you. 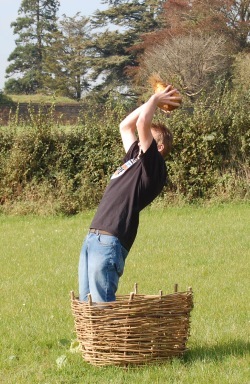 Right: The Norman is placed by the previous year’s Mangold King using a technique similar to the throw-in of modern football (see Rule 6.2). It is not as easy as it looks. 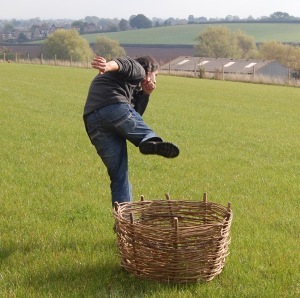 The pitching basket in this picture was made especially for the 2007 season by local craftsmen. No artificial methods were employed in its construction. Figure 1: The correct starting position - left arm straight with mangold touching the ground, legs apart and eyes fixed firmly on the Norman. 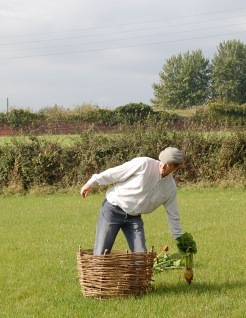 Figure 2: The arm is kept straight as the mangold is pitched using the classic “cart- wheeling” action. Figure 3: The secret of a successful pitch lies in knowing when to let go, which is just after the hurler’s arm has passed the 12 o’clock position (Greenwich Mean Time). 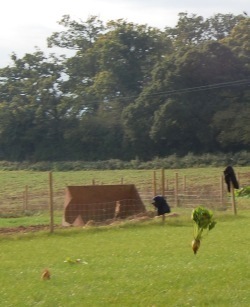 This picture amply demonstrates the aerodynamic qualities of the mangold wurzel. 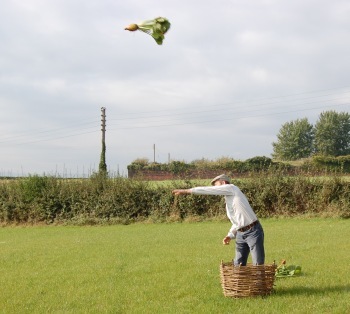 Who would have thought that such an earthly vegetable could be so graceful in flight? 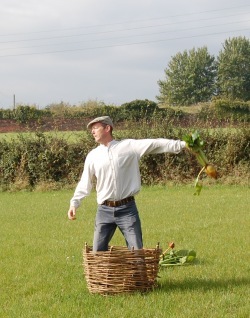 Note that this canny hurler has chosen a well-shaped root that is not too large. 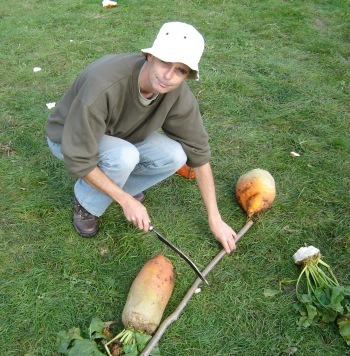 In the world of mangold hurling, having a large root is not as important as how you deploy it. Figure 4: The mangold’s leafy top acts as a natural parachute, thus slowing its descent. Nevertheless, it will still hit the ground with considerable force so spectators are advised to stand well clear. In this particular case they seem to have stood very well clear indeed, possibly to the extent of going home. 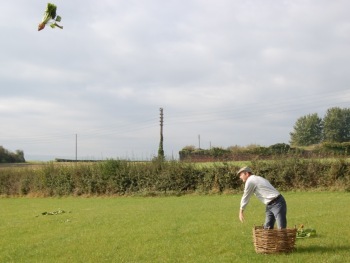 Figure 5: Here to the right of the picture we see the mangold coming in to land, not far from the Norman which is over to the left. Figure 6: Thump! The mangold hits the ground. 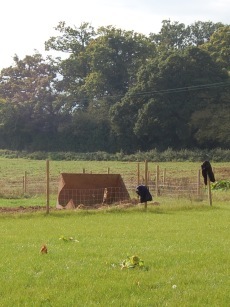 It must now remain there until all further contestants have pitched their mangolds. 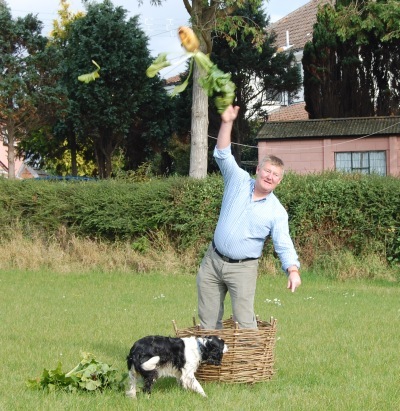 Left: The Squire takes aim, but he has chosen a large and mis-shapen mangold. Will it prove to be his undoing? Yes, apparently it will. The mangold veers off to the right (from the Squire’s point of view) because of its poor aerodynamic qualities. This just goes to show that careful selection of the mangold is one of the most important factors in winning the game. 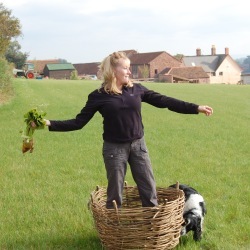 Right: Having pitched their mangolds, contestants should try to leave the pitching basket in a dignified manner. 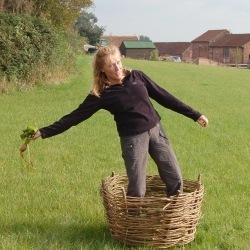 When all contestants have pitched their mangolds, it is the job of the Willow to measure the distance between each one and the Norman to determine which is the closest. To do this, the Willow uses a measuring stick called the willow, and marks the distances on it using the Special Cutting Tool. For further details see Rule 6.5. 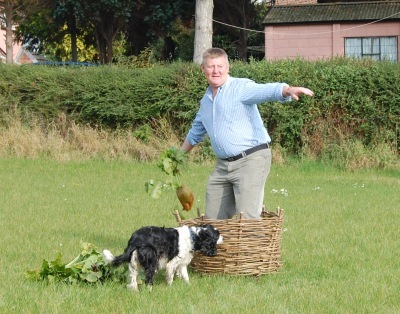 Often it is patently obvious which mangold is closest, in which case the services of the Willow may be dispensed with.